TO all the people who have had to endure 100mph winds, driving rain and travel disruption caused by the latest storm to batter the British Isles in the last 24 hours, the meaning of the name ‘Imogen’ will be met by shakes of the head. Storm Imogen is doing anything but live up to her name, which is derived from old English words for ‘innocent’ and ‘last born’, neither of which apply to a weather event which has grounded aeroplanes, trapped ferries in dock and stopped trains across large parts of southern England and South Wales. Imogen is the ninth storm to sweep in off the Atlantic since last November, when meteorologists began following the American model of giving names to major storms and hurricanes. As well as being far from innocent, Storm Imogen - which follows on from Abigail, Barney, Clodagh, Desmond, Eva, Frank, Gertrude and Henry - will not be the ‘last born’ of the winter. Storm names have been chosen by the public and are named alternately boy/girl/boy/girl. Once the list of names is exhausted, the process will start again, with a boy’s name being used for A in the second phase. Five letters are excluded - Q,U,X,Y and Z - because the Met Office feared it would soon run out of viable suggestions. 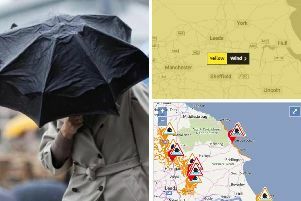 The next storm, once it is identified by the Met Office, will be called Jake, followed by Katie, Lawrence and Mary, and residents across Yorkshire will be hoping they do not prove to be as destructive as Eva, which brought flooding misery to the Calder Valley and York on Boxing Day. Abbreviation of the Hebrew name Jacob, which means ‘He grasps the heel.’ Prepare to be blown off your feet. An Americanisation of Laurence, from the Latin ‘laurel crowned.’ Watch for trees coming down. One from the bible and translates as ‘bitter.’ Take shelter from this storm down the pub. From the Irish Niall, which means ‘champion,’ If this is going to be a champion storm, best start making plans for Nigel. Means ‘golden’ in Irish. Which may mean lots of sunshine from Storm Orla. Or maybe not. From the old English for ‘fond of horses.’ Expect heavy rein. In Greek, Rhonda means ‘powerful river.’ Sandbags at the ready folks. A variant of ‘Steven crown’ meaning wreath. Don’t forget to leave a will, this one could be nasty. In old English, Tegan means ‘beautiful person.’ So just stay indoors and admire the view. From the Latin for ‘young at heart,’ Should make the bluebells grow, this one. Name created by J.M. Barry in the story Peter Pan. RNLI put on high alert, not for pirates, but for Wendy boat comes in.